Softronic locomotives can carry twice as much as an ordinary car and have an electric power-saving system during braking. That is the only one and unique system in Eastern Europe! The locomotives will carry iron ore, beyond the Polar Circle, in special conditions. The electric locomotives coming next year to Sweden, can tow up to 3,000 tons, which means they are among the most powerful electric locomotives in the world. LAPP Kabel Romania contributed to this successful project, equipping locomotives with LAPP products, mixing over 148 product articles to meet all the technical conditions and requirements in the best way. Softronic has used LAPP products to produce particularly powerful locomotives designed to tow wagons loaded with iron ore exploited in Sweden near the Polar Circle. 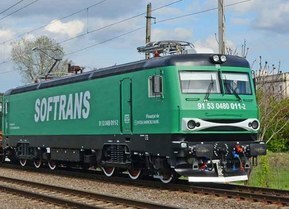 Transmontana locomotives are recognized at European level, being the most advanced locomotives made in the East of Europe with homologation certificates both from the Romanian Railway Authority and from the Hungarian Railway Authority. The locomotives are equipped with modern equipment: a new metallic structure (lcomotive box), asynchronous traction motors, recuperative braking, IGBT traction electronic converters, high performance electronic control and command equipment, LED headlamps, etc. The extremely harsh conditions in which these locomotives will work have forced the choice of a cabling manufacturer who can deliver a coherent product system with excellent performance. The conductors from the ÖLFLEX® TRAIN 331 family were used for wiring cabinets. The hot areas have benefited from the quality of the silicone conductors from the ÖLFLEX® HEAT 180SiF family. a locomotive have forced the use of a super-flexible cable for cable-chain applications. At the same time, the quality of the polyurethane outer sheath and the copper wadding screen resist the harsh climatic conditions that persist on the polar circle and intense electromagnetic noise specific to the power electronics. EPIC® industrial connectors have been used to make the electrical connections. Some of the cables have been protected by using the polyamide protection hoses, SILVYN® RILL PA6 and the corresponding locking pieces. "From the point of view of the conception and the electronic schemes, I can say that the Transmontana locomotive is at the highest level. For example, it is equipped with a recuperative brake, so at the moment of braking energy is sent back to the grid,” Catalin Iosub, Project Manager, told Economica.net. Also, Dan Ionas, Sales & Marketing Manager of LAPP Romania, said: „We are very happy with the inauguration of this project. Definetly it’s always a pleasure to see our projects succeed like this. It was a challenging task but due to our excellent line of products and team of professionals we managed to fulfill the complete requirements of our client.